All signs are pointing to a turnaround for the global economy, but there may still be murky waters ahead. 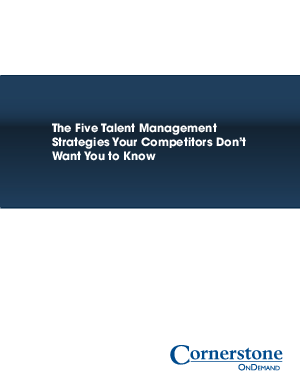 To optimize your talent strategy, learn how organizations with forward-thinking approaches to talent management develop and retain employees and drive revenue in new ways. Based on our work with industry-leading organizations, Cornerstone OnDemand offers five strategies for your organization to address these initiatives.